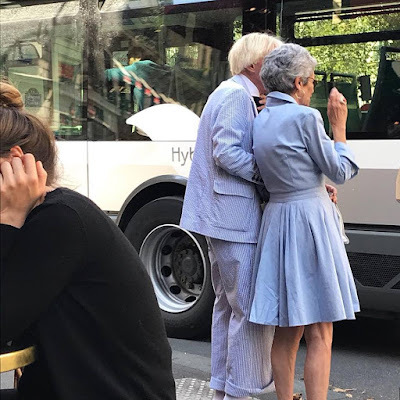 I just arrived in Paris and while I'm jet-lagged and still trying to catch my breath, I wanted to share this photo of an older couple, wearing seersucker and strolling down Boulevard Saint-Germain. I watched them for quite a while as they strolled hand in hand down the boulevard. I wish I could have taken a photo when they first came my way. Oh my goodness, they were certainly of "a certain age" and so very, very chic and adorable. More than this, they were smiling--obviously happy to be together and obviously very much in love. And you know what--the couple gave me a great feeling about growing old with Dr. Thompson (my husband, chief farm and head chef at La Belle Farm). Yes, romance exists at any age, at every age! And dear friends, I wonder what you think! What is the secret to love at every age? Is it holding hands, being affectionate, walking together, talking, kissing, sharing secrets? Or is it all about wearing seersucker outfits? What are your thoughts? I'd love to know!